Frank was born in Windsor in 1887, the fifth child of Thomas and Alice Church. The family home was at 64, Oxford Road, Windsor. He attended St Stephens School, Vansittart Road, Windsor and after leaving school he trained as a French Polisher. He married Sarah Ann Barrett on 24th December 1910. They had 2 children. Sarah was the daughter of Mr & Mrs Barrett of Brook Villa, Boveney. In all probability this was a Boveney house, alongside the stream by the Common gate. After moving to Eton Wick he became Assistant to the village Scout Master. When war came he joined the 2nd/4th Battalion of the Royal Berkshire Regiment. In peacetime the regiment had two regular serving Battalions and two reserve and territorial. Soon after the outbreak of the war another territorial Battalion was formed at Reading, and this was designated the 2nd/4th. 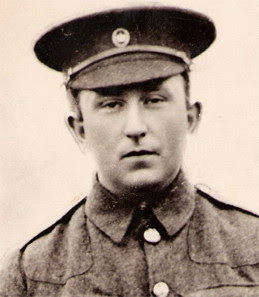 Frank enlisted in Maidenhead and nominated his parents as his "next of kin". These men were commanded by Colonel Hanbury, and they were initially accommodated and trained on the Hanbury Estate at Hitcham. Clothing and equipment was in very short supply, and the men trained for war with wooden rifles. Eventually though, training was completed, and on May 27th 1916 the Battalion was shipped to Havre. A little over four weeks later, on July 1st, the Battle of the Somme started. Although the 2nd/4th was not involved on the Somme Front, they were engaged a mile or two north of the line in an attempt to prevent the enemy sending troops from the sector to re-inforce their comrades in the main battle area. The Somme campaign was a very costly enterprise and on the first day the British suffered nearly 60,000 casualties, a third of whom were fatal. 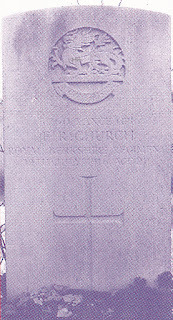 On July 19th Frank Church was killed. By all accounts he died courageously and at the time, the village scouts would have been very proud of him. He fell at Ferme de Bois and was buried several miles north of where he was killed. Lance Corporal Church had been associated with the Boy Scout movement for many years. After being Assistant Scout Master of the 3rd Slough, St. Mary's troop, and the Scout Master of the Holy Trinity, Windsor troop, he became, on moving to Eton Wick, the joint Scout Master of the troop there. He was a born leader of boys and had a high standard of duty in all which he undertook. All will sympathise with Mrs Church who is a daughter of Mr Barrett of Brookside Villa, Eton Wick (Boveney). We are proud of the gallantry of our fellow parishioner. R.I.P. In Memory of a Gallant Soldier. During the afternoon services at Boveney Church on Whit Sunday, Colonel Beresford of Old Place, Boveney unveiled a bronze tablet in memory of Corporal (sic) E R. Church of the 4th (sic) Royal Berkshire Regiment, (Mrs Church and her two children being among the congregation) who was killed by the enemy on July 19th 1916 at Ferme De Bois, on the Somme front, in France, while he was trying to bring in, by night, some wounded soldiers, a service for which he had volunteered. His comrades in the regiment defrayed most of the cost of the tablet as a mark of their esteem and affection. It may be added that Corporal Church had been, before the war, Scout Master at Windsor, and when he came to live at Boveney, was joint Scout Master of the Eton Wick troop. The tablet was designed by the makers, Messrs. Gawthorp and Son of Long Acre, London. No official award was made to Frank, who was killed in the performance of his brave action. Only the Victoria Cross is awarded posthumously, but had he survived he would probably have been recommended for the Military Medal or the Distinguished Conduct Medal. Frank is buried in Laventie Military Cemetery, about six miles south west of Armentieres and two miles behind the front line of July 1916. The cemetery was first used in June 1916 and contains 420 —burials: 413 being from the United Kingdom, four Australian and three German. Frank was 29 years old. His special memorial tablet is in Boveney Church, and he is commemorated on the Eton Wick Memorial and the Eton Church Gate tablets. His father-in-law, Mr Barrett, worked diligently on the village memorial committee, to ensure the village men were accorded a fitting monument. 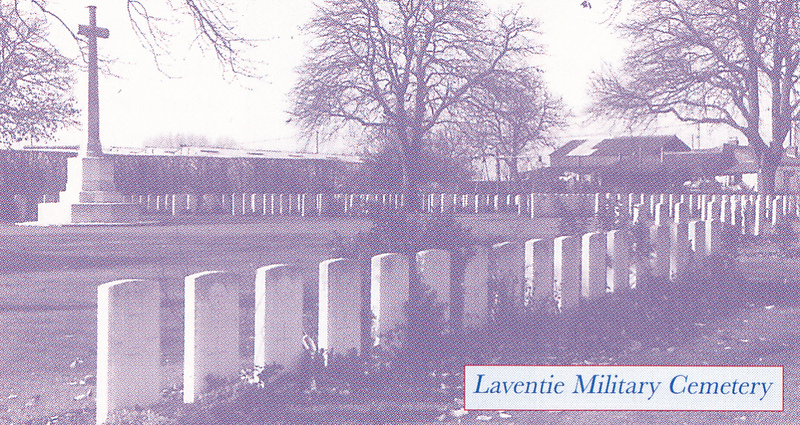 A description and history of the Laventie Military Cemetery can be found on the WW1 Cemeteries website.